Chrondrosarcomas originate from bones. It is a form of bone cancer. I just so happen to be a sufferer of a rare bone cancer because of its obscure primary growth area on the base of my skull. So with that in mind, the possibility of it metasizing to other parts of my body (namely my lungs) is highly possible. Strangely enough, the neurosurgeon over at General Hospital did not advise on getting a CT scan done for my lungs...for which I'm both relieved and confused at the same time knowing the circumstances of not going thorough with this disease. I do have an appointment with the oncologist at the General Hospital next Tuesday to discuss further on this issue. He may or may not suggest an additional CT scan for my lungs to be done...but whatever the case, he should be able to refer me to the nearest possible medical institute for my radiotherapy or tailor a radiotherapy schedule himself/herself when I go for my consultation on Tuesday. 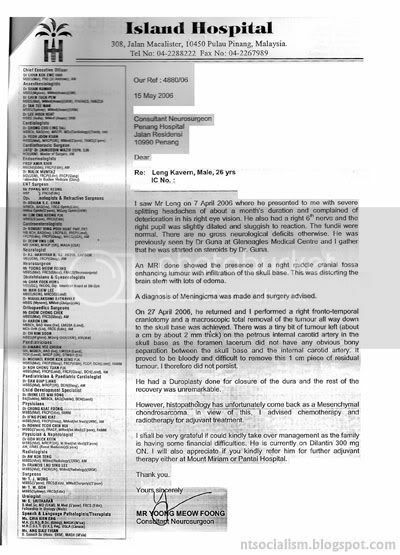 Radiotherapy cannot be performed in the General Hospital because the machine used for it has malfunctioned for quite some time pending repair work. In the new MRI scans done in a private hospital (waiting list @ GH was too long; 2 months! 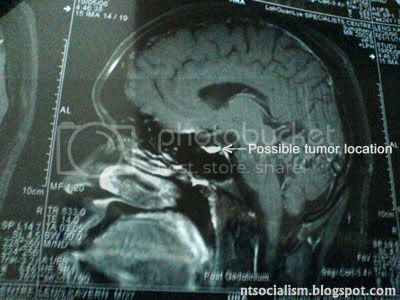 ), the tumor is not as evident as it was before. 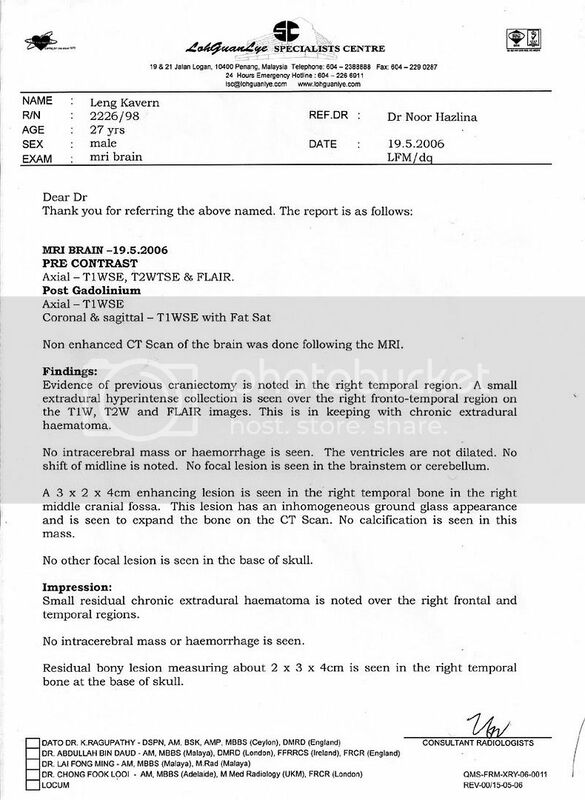 In fact, I do believe these scans would still be inconclusive to the untrained eye. 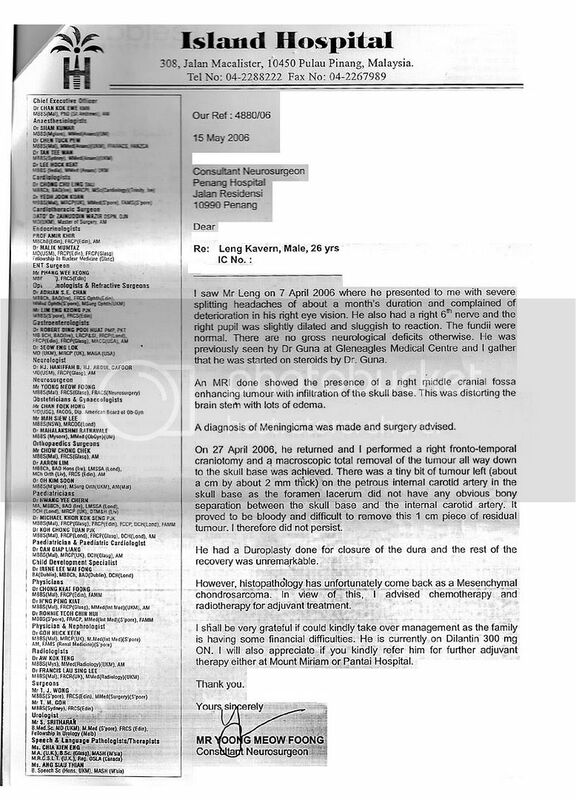 In addition to that, the radiologist's report somewhat contradicts what my surgeon had reported in his referral letter. This also needs to be further discussed with my oncologist on Tuesday. 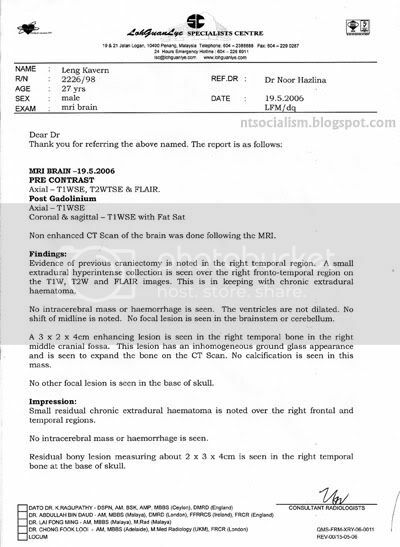 Anyway, as the plot thickens, here are various scans of my recent MRIs and radiologist report. Next batch of updates in regards to this will be next Tuesday. Take care and God bless.